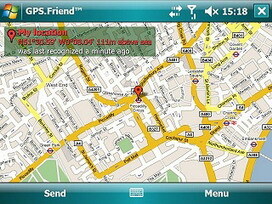 GPS.Friend by JGUI - Friend localizer app for Windows Mobile. This is an useful WinMo app that lets you find your friend, family, or whoever from your cellphone with built-in GPS Receiver or receiver connected in any way. You can review your position on the map, with no worry about pre-installed maps, because it's downloading from the Internet. Interestingly, you can "ask" someone's phone (who has this program installed too), about his/her current location. In reply you review his/her position on the map, and the calculated distance and direction between yours. 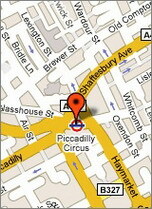 + Review on the map your and someone's location. No data and values of yours positions are collected by any server (like others programs do). In this application, the location exchanging does directly between Windows Mobile phones by using ordinary SMS network service. 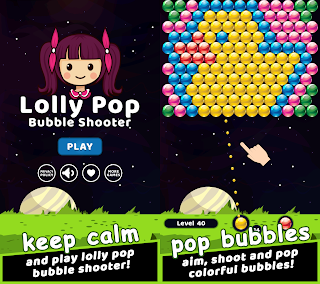 GPS.Friend works on both Windows Mobile Professional and Standard edition smartphones and supports all screen resolutions. + optionally: GPS Receiver built-in or connected. GPS.Friend can be a freeware for everyone who needs to get own location and receive someone's external location for ONLY one time daily. If it's not enough, you can buy the full version for 17.25 EUR. Additional licenses (after one is purchased), cost 9.95 EUR, with unlimited location requests of course. Interested? More information is available from the official website. 0 comments on "GPS.Friend by JGUI - Friend localizer app for Windows Mobile"